You've read on Pisteuomen a number of times about my college buddy Daren Wendell, who is attempting to be the youngest person to walk around the earth. 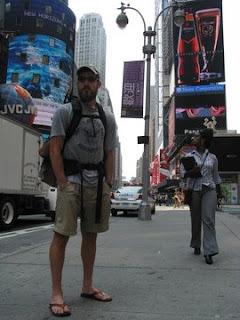 To date, he has traveled somewhere between 1,500 and 2,000 miles, crossed 12-13 state lines and is starting to raise decent money and awareness for his cause (Blood:Water Mission in Africa). Today, he was featured in the magazine Vanity Fair where he was interviewed. (CLICK HERE TO READ THE ARTICLE). Give the article a read; it's quite fascinating. Also, if you're able to support the cause, please do so. Blessings! Thanks for visiting Pisteuomen today. I hope you'll keep coming back. By the way, how did you land there? I looked at your site and read some posts. The YOUTUBE post about 9/11 conspiracies is interesting. The same thing happened to me about a year ago. It does seem like there are a lot of inconsistencies. Anyways, as I said, I hope you'll keep coming back to Pisteuomen.